How to Read the Tone Marks? There are four tones and a neutral tone (quin1sheng1) in Modern Standard Chinese. Please download this PDF file to see the graphic of the 4 tones. A neutral tone syllable is pronounced briefly and softly, and there is no tone marks for it. On the page 2 of previous handout, we have the students practice the tone marks as well. 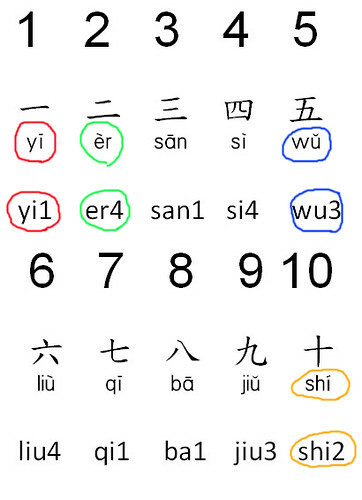 There are two ways of showing tone in pinyin, using tone marks or numbers, as illustrated below. If you already know the pinyin of the word you want to know, you can go to YB Chinese English Dictionary to look up its corresponding Chinese characters. 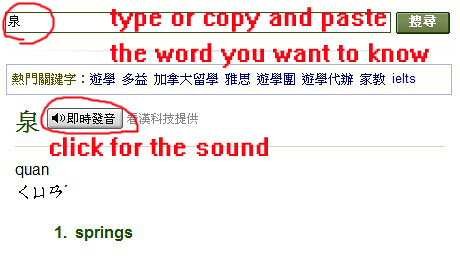 Select “Pinyin >> Chinese” first, then type pinyin on it. It will show you the Chinese character and English meaning. 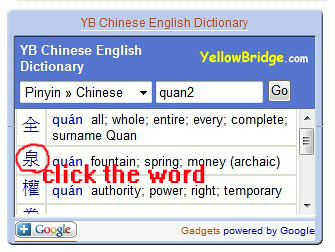 For example, type quan2 in the translation bar, you will see the meaning. To hear its pronounciation, you can click on the word. It will lead you to its homepage, and then you can click the sound symbol to hear its pronounciation. For more details about using English-Chinese dictionaries, please see my previous article on this blog.